The M-20 series is a line of composite material, diaphragm-operated hydraulic control valves with a working pressure up to 10 bar. The polypropylene construction is suitable for industrial installations in mining and processing plants. The M-20 utilizes the elliptic shaped diaphragm for a smooth and accurate closing and opening over a wide range of flows, with drip-tight sealing. It integrates well with a wide variety of regulating control pilots, solenoids and control accessories. The M-20 is compatibly designed for water level control, flow control, electric & remote control, pressure reducing & pressure sustaining operation, in addition to a full range of tailor-made solutions. The control valve combines high flow capacity with exceptional hydraulic performance. 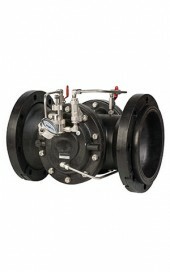 Positive drip-tight sealing is guaranteed by the elliptic diaphragm design and its resilient sealing surface.